Identification: This species has a cream body frosted with powder blue and with pale yellow on top of its head. The cerata are pastel violet frosted with white and with white tips. The rhinophores are orange with a subapical white ring. Natural history: Antonietta cf. janthina is known from one animal found in a silty Halimeda kanaloana bed at 8-10 m (26-33 ft). Distribution: Maui: Antonietta janthina is known from southern Japan. Taxonomic notes: It was first recorded in Hawaii from Maalaea Bay, Maui by PF on Oct. 5, 2007. 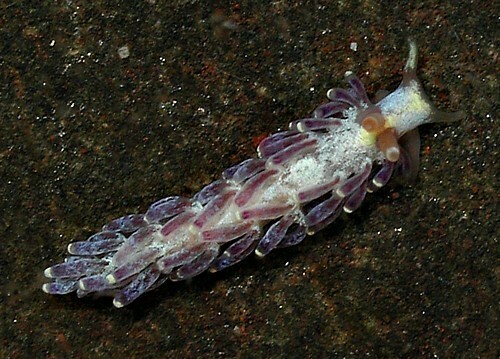 Photo: CP: 5.5 mm: found by PF; Maalaea Bay, Maui; Oct. 5, 2007.